We know all too well that starting a business is an exciting and often overwhelming endeavor. We have dedicated our careers to helping individuals and business owners focus less on the everyday stresses of finance and more on what they love. Our team has always been passionate about helping others. 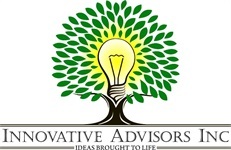 Today, at Innovative Advisors, Inc, our team helps individuals as well as small business owners, identify and pursue their dreams and ambitions by providing innovative guidance and support specific to their personal and business goals. Contact us today to experience the benefit of working with professionals who intimately understands the need for planning and what it means to be a business owner.